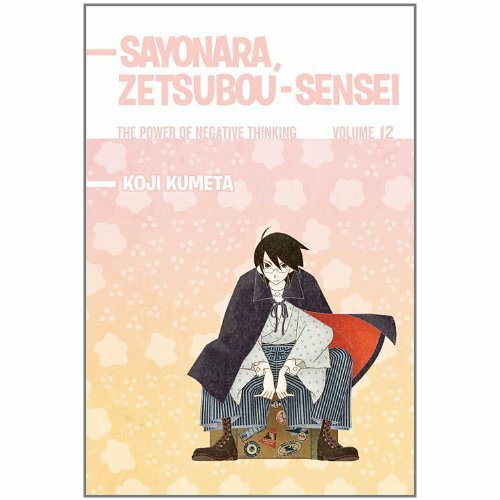 Zetsubou Sensei manga, v12: the first season of the anime appears to have ended (there are some comments in the text about that and about working with anime creators). The explanatory notes in the back seem briefer than in the Del Rey volumes, but I think they catch the important things. The translators also appear to rely more on the reader’s intelligence in picking up references from context. In that, I think they got the right balance. Koji Kumeta’s art style was designed for SHAFT. Plain, stylized figures, high contrast images, sharp lines, walls of text. Looking at Nisemonogatari while reading this, I wonder if Kumeta influenced SHAFT’s artists a little, or maybe even liberated them a little. There’s a great two page spread in chapter 117: Chiri’s aura as perceived by Kaga Ai is a wonder torn from the notebooks of a schizophrenic. I’d have thought the Zetsubou Sensei schtick would have worn thin by now, but with the passage of time, it seems like Kumeta’s better able to play off the established characters. Plot progression in my Zetsubou Sensei? No, nor character development. Kumeta has established his archetypes and now can join the audience in heckling them and their foibles. On the other hand, the concept seems really disposable — I don’t know that the schtick can bear multiple readings, even with the nuggets hidden on every page (having said that, I think Kodansha’s production values are fine in this volume). This volume, Kyoto Animation (or its fandom) is in for a good deal of mockery — Lucky Star is mentioned several times, the Haruhi dance appears in one of the lists, and (perhaps only related, as it’s about the visual novels) one panel has a cycle of Key games interrupted only briefly by a Type-Moon detour. It’s kind of amazing to me that this series apparently continues to thrive in translation — 12 volumes! — when other series withered on the vine. Not that I’m complaining about this series’ continued success. But gosh, I wish a little had spilled over onto Moyasimon. Wait, this is still coming out in English? Last volume I’ve seen in a store was 7. Guess I’ll have to start checking Amazon. Yes, it is — volumes 13 and 14 are scheduled for release in the coming months, as well.